Cantuccini Biscotti, are an Italian almond biscuit usually twice-baked, oblong-shaped, dry & crunchy. This recipe makes lots so freeze what you don’t need and have them on hand for when guests come to stay. Mix it up by adding chocolate chips, apricots, pistachio, or raisins. 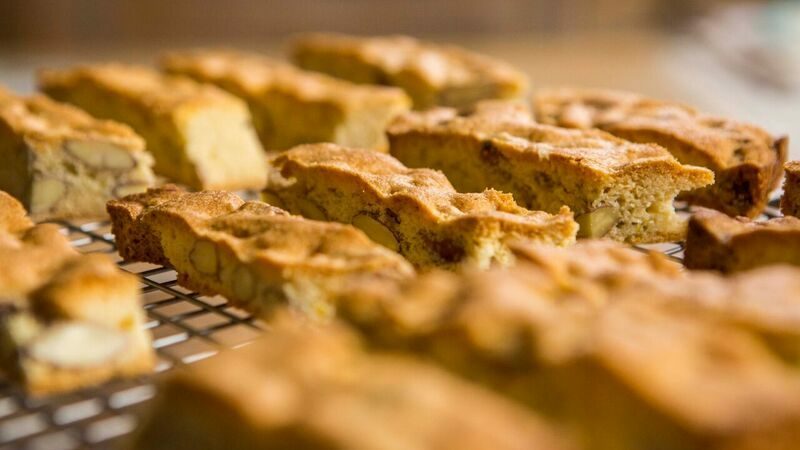 Try our simple recipe to create this Italian sweet treat for yourselves. MELT the butter in a small saucepan over a medium heat, remove from the heat and leave to cool. MIX together in a large bowl the flour, almonds, sugar, salt and baking powder. ADD the eggs, cognac, vanilla extract and orange zest. ADD the cooled butter to the flour mixture and mix until it starts to form a dough – it will be quite crumbly. BAKE in the oven for 25 minutes, until risen slightly and golden brown. If you remove them now they will be chewy. For a harder biscuits leave an extra 10 mins longer. CUT into large fingers and sprinkle with icing sugar.